Happy Valentine's Day! I hope you and yours are making the most of this sweet day. Me and mine are being lazy today, lounging around after a breakfast of Cabo Breakfast Burritos, just trying to recover from my latest travels. My house smells like roses and lilies thanks to a Valentine's delivery from my sweet dad. With love in the air....on to the food! I love making pies, tarts and quiche. What do these three dishes have in common? a delicious buttery crust. I have family recipes that are so flakey and buttery that they are basically pie perfection but they require quite a bit more love and attention to make. I had to have a basic pastry dough that I could whip up in a flash and know that I can count on for those times when I had to make extra batches. 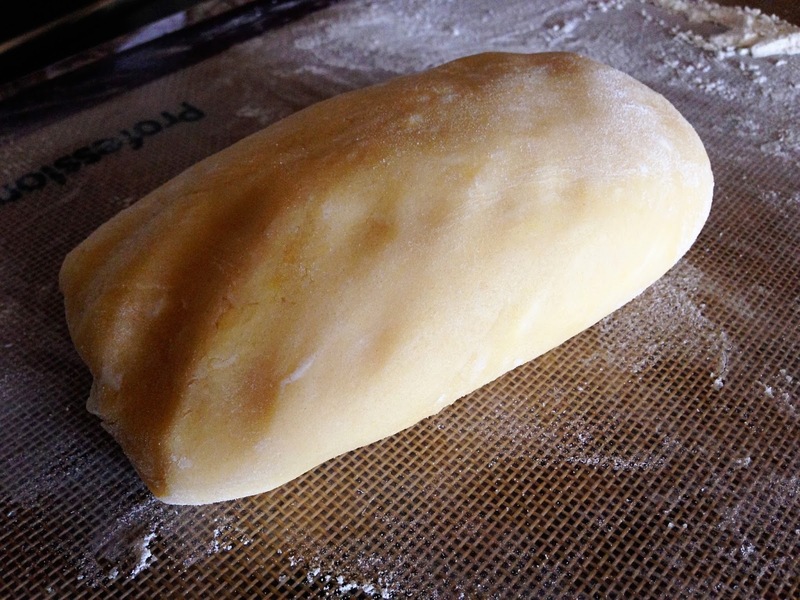 This pastry dough is my go-to basic recipe. Double it, Triple it, whatever you need! In a food processor fit with either a dough blade or metal blade, combine dry ingredients and pulse a few times. 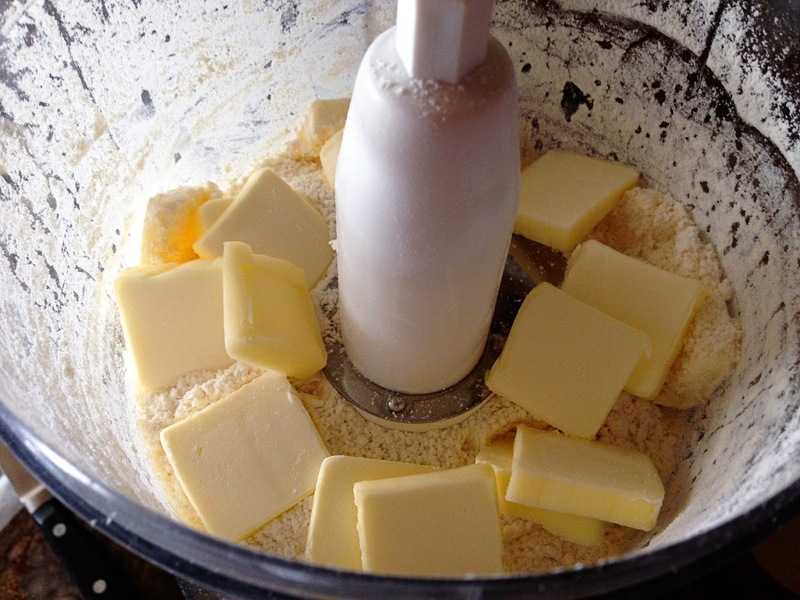 Cut butter into pats (this just means to slice the stick of butter into approximately 1/4-inch slices). Add the cut butter to the dry ingredients and pulse until the butter is combined well with the dry ingredients. It should be a light, fluffy, crumbly texture and no chunks of butter should be visible. Add in the egg and pulse 10 times. Turn the processor on and let it run for 15 seconds. 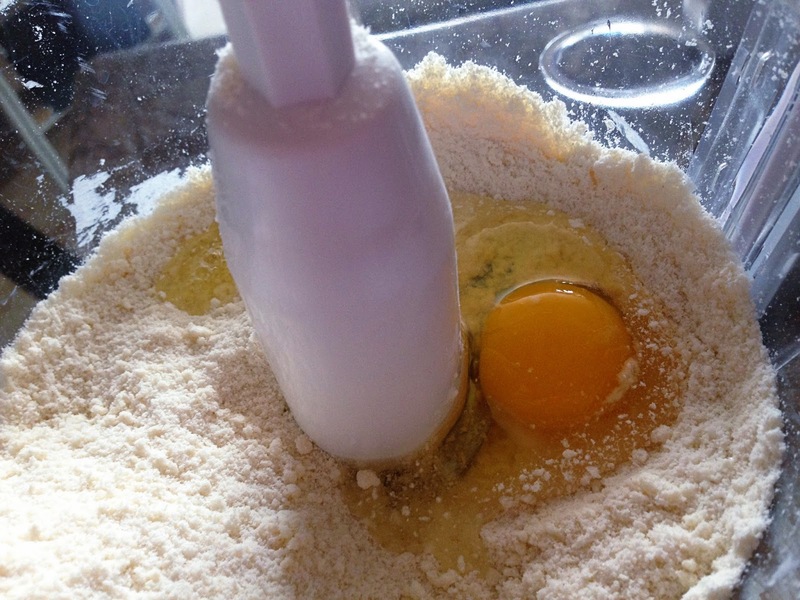 Your dough should start to gather into somewhat of a ball. It may not come together as well with a metal blade, I use the plastic dough blade. 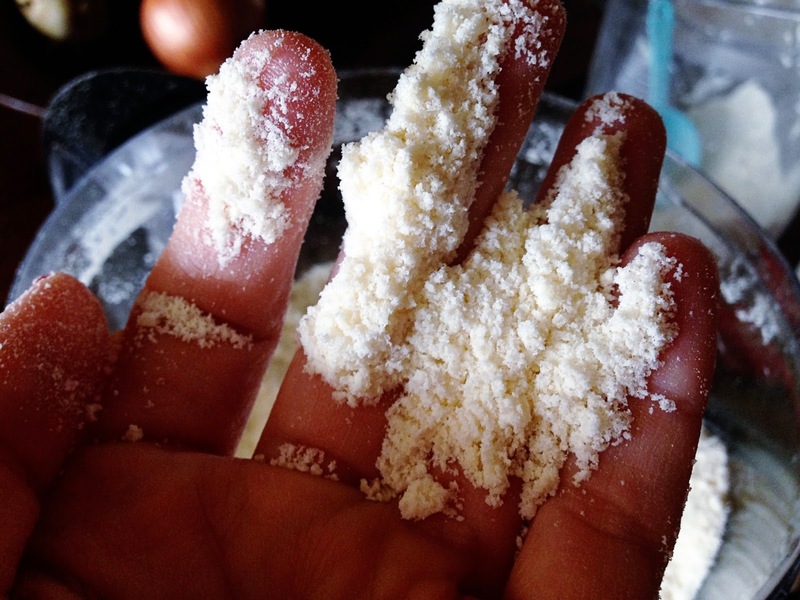 Flour your work surface and dump the dough out on the surface. 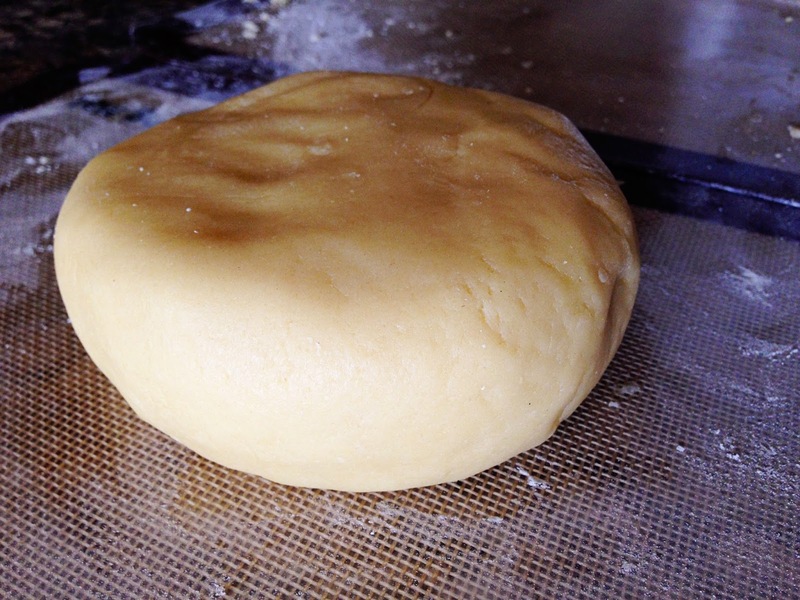 Work all the dough by kneading it together a few times until it becomes one smooth ball of dough. Divide the dough in half. Flatten dough into 2 disks and place in refrigerator for an hour (you can leave it overnight if you wish). When ready to work, place one disk on a floured surface (leaving the second disk in the refrigerator until you are ready to use it.) 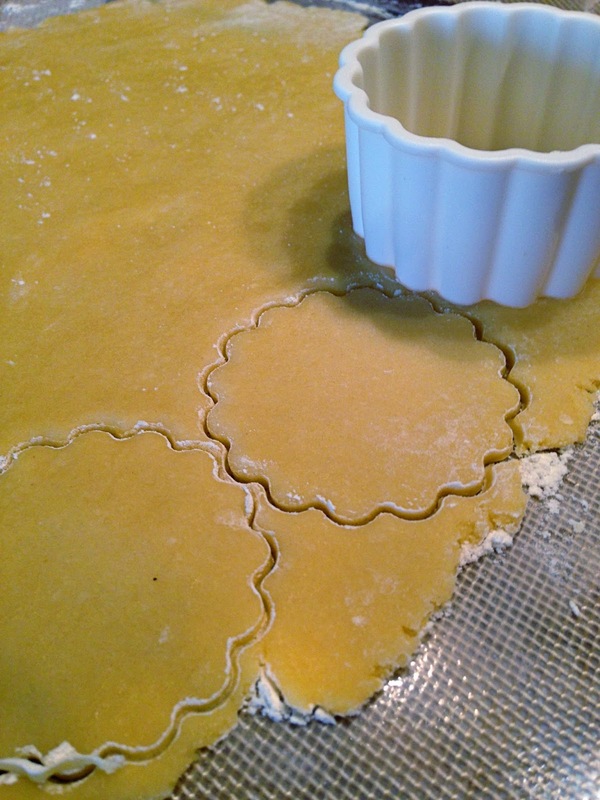 and begin to roll the dough out to desired size to begin making your tart or pie. This recipe makes up to two 12-inch crusts. I used this batch of dough to make little desserts for a cocktail party. 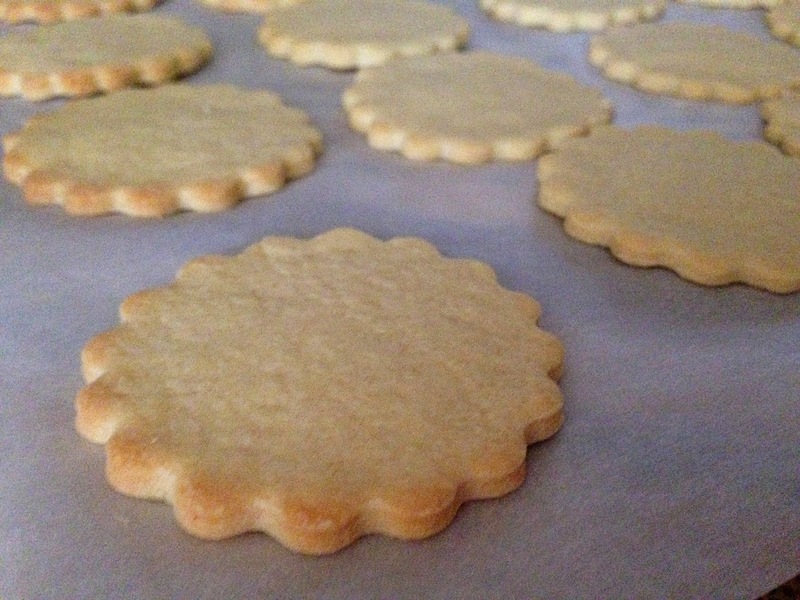 I used a fluted cookie cutter to cut the dough into flat "cookie" type bases. 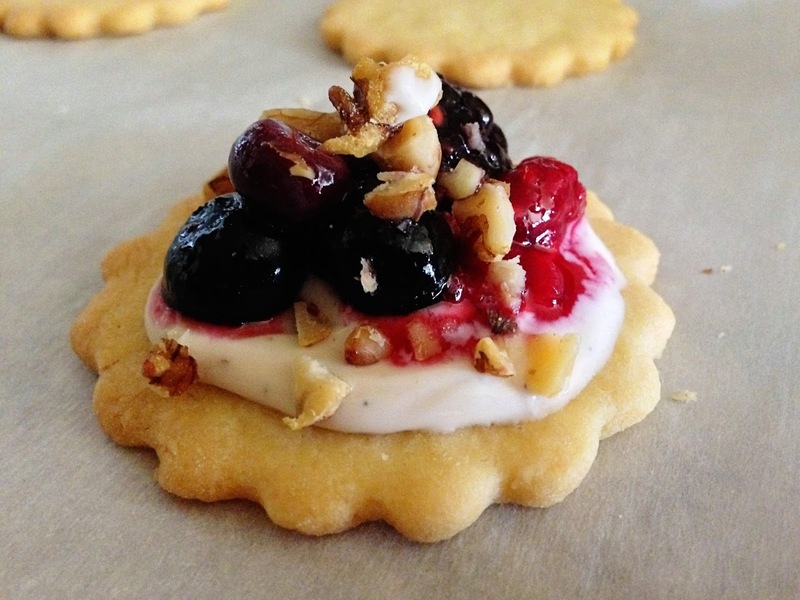 I then added a dollop of vanilla bean custard, berry compote and chopped walnuts. The possibilities are endless!